It has been difficult to keep up with all the events recently. Please check my Facebook Page for recent updates. February 6, 2013 (2:00pm to 3:00pm) in Hall 1A , New Delhi World Book Fair Pragiti Maidan, Delhi. February 9, 2013, 6:00 pm at Hotel Clarks Amer, JLN Marg, Jaipur. February 16-17, 2013, The Hindu, Lit for Life Festival Chennai. Details here. February 23, reading at the British Library, Bangalore. Details to follow. February 4, 2013, Reading at Bookwise, Shahpur Jat, Delhi. January 31-February 2, 2013, presented at the Kolkata Literary Meet Details here. January 25, Launch of Of Mothers and Others, Jaipur Literary Festival. Monday, January 21, 2013 at The Press Club, Thiruvananthapuram, the Kerala Launch of Not Only the Things that Have Happened. Story about it in The Hindu. Saturday, January 19, 2013 reading at the Hyderabad Literary Festival. 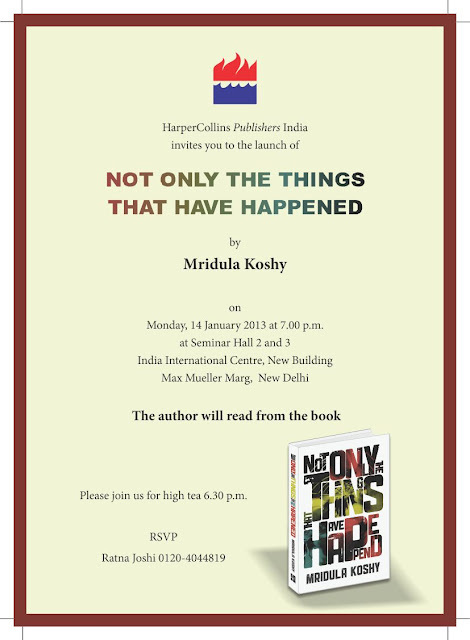 Monday, January 14, 2013 at IIC in Delhi, a reading from Not Only The Things That Have Happened. Guest Speaker: "Literature of Committment," School of Social Sciences, JNU, November, 2010. Reading: Kovalam Literary Festival, October, 2010. Presenter: Faculty seminar series, Jamia Millia, September, 2010. Moderated: Commonwealth Writer's Prize Panel Discussion on Multiculturalism, April, 2010. Reading: Friends of Books, Book Swap and Reading, Delhi, March, 2010. Reading: Electric Sweet Water Girl, Khoj, Delhi, February, 2010. Reading: Friends of Books, Book Swap and Reading, Delhi, January, 2010. Award/Reading: Shakti Bhatt Award Ceremony, Delhi, December, 2009. Book Launch: If It Is Sweet, Bangalore, July, 2009. Book Launch: If It Is Sweet, Chennai, July, 2009. Book Launch: If It Is Sweet, Portland, Oregon, June, 2009. Book Launch: If It Is Sweet, Mumbai, May, 2009. Book Launch: If It Is Sweet, Delhi, May, 2009.